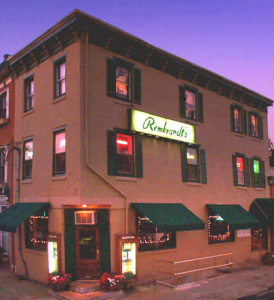 Rembrandt’s has been around for a quarter of a century. This past October (2009), however, the restaurant changed ownership. 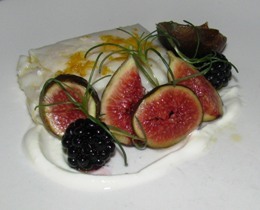 And, just recently, Robert Legget, formerly executive chef at Cuba Libre, took over the reigns in the kitchen. Thus far, judging by my last two visits, Mr. Legget appears to be acquitting himself with suitable aplomb. 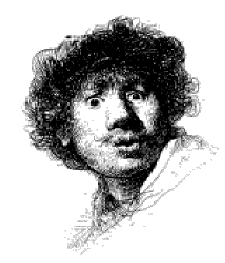 But don’t get the wrong impression; Rembrandt’s isn’t one of those fancy-schmancy Philadelphia eateries. No, this is very much a neighborhood “joint” – in the very best sense of that designation. The locals and visitors to the nearby art museum pile in to the ancient, comfy bar for the 5:00 p.m. – 7:00 p.m. weekday happy hour, which headlines drafts, house liquors, and house wines at $3.00 per, plus a number of inexpensive appetizers. And the regular menu offerings are quite reasonably priced as well. You might begin, for example, with the babaganoush, roasted eggplant “hummus,” quinoa salad, and wood-oven pita chips ($7.00); selection of cheeses replete with gastriques and fruit ($9.00); or the spicy buffalo wings with pickled carrots, celery, and blue cheese salad ($9.00/$15.00). But the restaurant also features a number of flatbread concoctions and thin crust pizzas. So if you’re a party of four (or more), this is really the way to go. 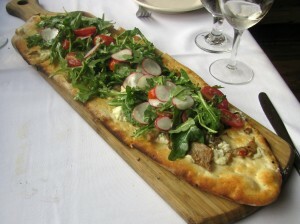 The “Rocket” is comprised of peppery arugula, organic goat cheese, mushrooms, tomatoes, radishes, and splash of truffle oil all artfully assembled on mushroom flatbread. ($10.00; and be sure to add chunks of savory Italian sausage for an additional $3.00). Then, of course, there’s also the “Rustica” pizza: plum tomato sauce, pepperoni, aged provolone, and mozzarella ($12.00); the “Margherita” is a variation on the theme and sports plum tomato sauce, mozzarella, sharp provolone, and basil ($10.00). The restaurant does serve a limited number of entrées from 5:00 p.m. – 10:00 p.m.; items such as streak frites ($19.00) and horseradish pepita (pumpkin seeds) crusted salmon ($16.00), for instance. But what you see flying out of the kitchen at the speed of light are the generously proportioned burgers and sandwiches… and they are very good, indeed. The lamb burger, moist and succulent, is teamed with feta cheese, fennel, red onion, arugula, toasted paprika vinaigrette, kalamata olives, and served up on nine grain bread ($12.00). Spectacular. 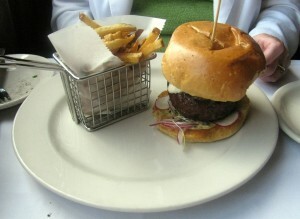 But even better, in my opinion, is the monstrous 21-dry-aged 10-ounce Lancaster County beef burger topped with crispy pork belly, Dijon mustard, black truffle mayo, and onion sprout salad $14.00). All burgers and sandwiches are accompanied by either a small salad or fries. The salad is just fine… but the fries are incomparably delicious. For something different, though, I can also heartily recommend the pepita-crusted fish tacos. The mahi-mahi is perfectly prepared and companioned by Spanish olives, cilantro, queso fresco, vigoron slaw (chopped cabbage, tomatoes, onions, and chili marinated in vinegar and salt), and pork-fried black beans ($12.00). Desserts here are exceedingly limited and, in reality, somewhat superfluous. Recently, however, the kitchen has been offering up several interesting ice creams, which are surely worth a try. Sampled during our last visit: egg & maple ice cream sprinkled with bacon (quite good); and basil ice cream anointed with tamarind sauce (odd… and more like sorbet than ice cream). Given its location just a few blocks from the Philadelphia Museum of Art, and boasting a paid parking lot practically at its front door, this is a great spot to enjoy a casual chow-down after strolling through the works of art.